We build each ServeWell® unit with heavy-gauge stainless steel, and engineer the body, legs, and base for strength and durability. The complete line of ServeWell® food tables is designed to eliminate the frustrations you have had with traditional food service units. Vollrath offers the first truly innovative design in value-priced mobile serving equipment. The insulated cold pan well provides adequate depth for sufficient ice capacity to enable short-term holding of full or fractional size pans, insets, crocks and bain maries. 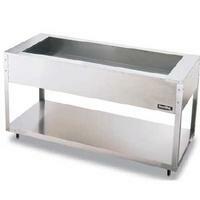 Stainless steel top, wrapper, uprights, undershelf, and stainless steel ice pan. Well insulated with EPS foam material. Pitched to a 1" drain and plug. Standard stationary legs are 6" high with 1" adjustment. Optional non-marking castors are 4" diameter, NSF approved swivel type, two with brakes.